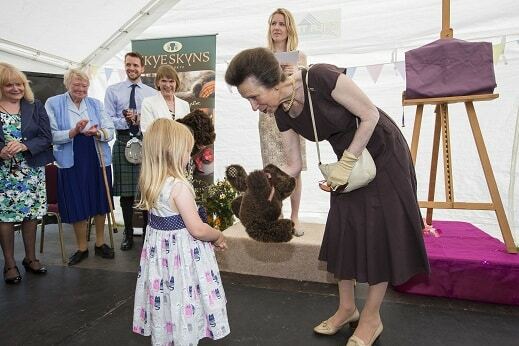 HRH The Princess Royal was offered a guided tour of the tannery and showroom by Jess Hartwell, whose family own and run the business, before being given the chance to meet Skyeskyns staff, as well as members of the Waternish community, at a marquee reception. She was also introduced to representatives from businesses who work alongside Skyeskyns, supplying their luxury products into the showroom: Johnstons of Elgin, Hebridean Woolhouse and Devonia Sheepskins. 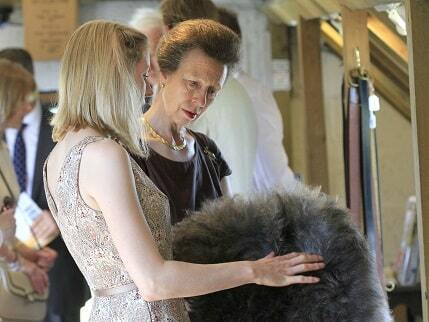 Before departing to visit other parts of the island, HRH unveiled a plaque to commemorate her visit and was presented with a sheepskin as a memento. The visit was an opportunity to showcase Skyeskyns’ role as the only remaining commercial sheepskin tannery in Scotland. In particular, it is unique in using only the most traditional, time-honoured methods to make its world-famous Highland hand-combed natural fleece. The business employs a number of local people and retains its close links to the Skye crofting community. When Clive and Lydia Hartwell founded the tannery in 1983, sheepskins on Skye were considered to be a waste product, but Skyeskyns saw the potential to make the industry more sustainable, transforming these fleeces into part of the range of luxury products now retailed from Skye across the world. “Clive was hugely proud of the Waternish community and the way local businesses on Skye support and sustain each other. By working together he felt – as I do – that we have been creating a durable and thriving business community here in the beautiful wilds of Waternish. Indeed, the importance of community and strong local support was clear throughout the visit. Skyeskyns used the opportunity to thank all those around Skye and beyond who had contributed to their development over the years, from Waternish resident Angan MacDonald, who dug the foundations of the tannery, through to Highlands and Islands Enterprise, who helped facilitate its most recent expansions. It was testament to the efforts of a great many, Jess said, that Skyeskyns had in recent weeks been confirmed as maintaining its five star Visitor attraction award. The pioneering role of the VisitWaternish tourism partnership was also praised at the event. Through this initiative, Clive, together with Stein Inn and Dandelion Designs, created a strong, self-sustaining network of businesses that led to Waternish being the first part of Skye to be effectively open for business all year round. The benefits from this, in terms of local employment opportunities, have been clear to see in recent years. 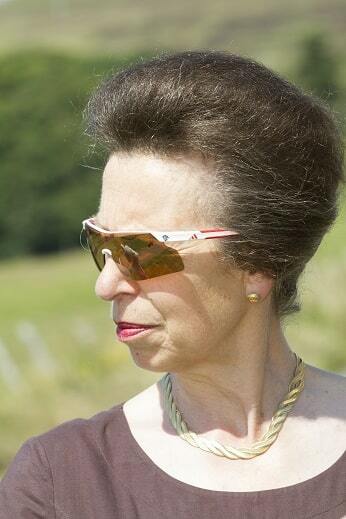 It is a real pleasure to see a business – which is such a family business – take such pride in what it produces. It’s the quality of the product which has made the success, and the network and the support of the community is equally an integral part of it. Businesses like these do make such a difference to attracting people’s attention to what is going on here. “It’s really nice to see the quality of work in a product which sadly had become seen as waste. It isn’t. This is a really good quality product which a lot of people would hanker after, and you have the ability to find it here. At the end of the visit, the whole family was even involved, as Her Royal Highness was presented with three sheepskin teddy bears for her own grandchildren by Clive and Lydia’s grandson Ruairidh and his friends Katie and Ciara.